Now that it’s socially acceptable to talk Christmas, I can finally tell you how excited I am for Christmas this year. ??? So much so, that I’ve been baking like crazy and bringing my holiday goods to work, trying to get everybody else as excited as me! We all went through a lot at work recently, so I figured we need some cheering up. And what better way to send your problems away than eating a lot of delicious cookies? ? The number 1 crowd-pleaser so far? 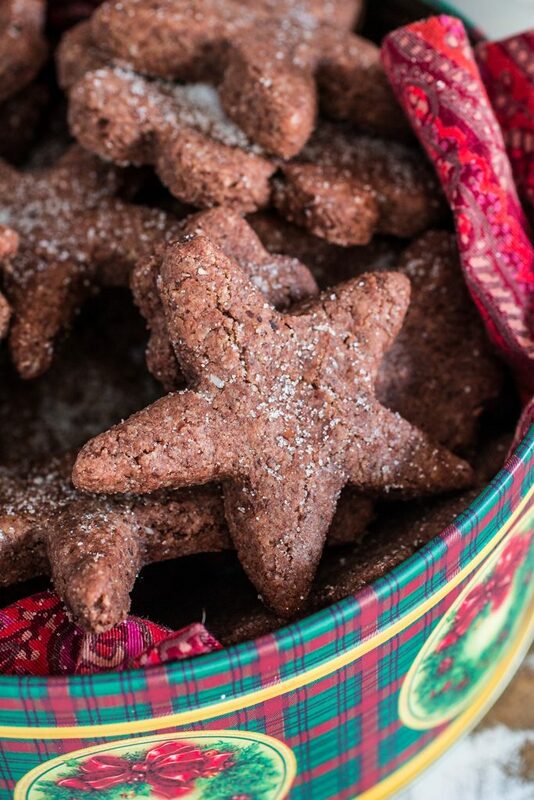 These festive Swiss Chocolate Spice Cookies, or Basler Brunsli in German. 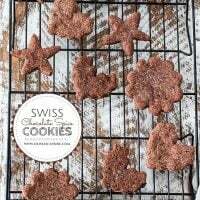 They are very popular in Switzerland during the Christmas season and are often described as Swiss brownies because of their chewy texture. Christmas last year was pretty rough. With me ending up in the ER every other day because of my sciatica, plus Lola eating a whole box of raisins (when me and Tim were out in the ER) and having to be admitted into a vet hospital for 2 whole days, there was not a whole lot to celebrate. We stayed home and Skyped with my family, who were in Brazil ’cause they couldn’t afford a trip to the U.S. ? The blog, consequently, suffered a lot, as I didn’t have the energy or the motivation to make all the amazing Christmas recipes I had planned on sharing. So this year, to make up for it, I’m holding on to every little tradition and old-fashioned Christmas magic as much I can. Tim and I are flying down to Brazil to be with my family, and I already told my Grinch of a mom that I won’t tolerate a Christmas without a Christmas tree. So she is annoyed that she now has to buy – or borrow – a Christmas tree when she doesn’t even care about Christmas that much! I also bought a bunch of Santa hats and reindeer headbands and I’ll make everybody dress up for our Christmas Eve feast.? ? ??Ha! Seriously, I just can’t contain myself. I’M SO EXCITED! I hope you are not sick of my excitement already, like some of my relatives.? ? I mean, you wouldn’t click on a Christmas cookies post if you weren’t excited for Christmas, right? To be 100% honest with you, I rarely bake cookies. But when Christmas time comes, the baker in me awakens and the kitchen becomes this chaotic flour-sugar land where all sorts of magic happens with the aid of clever little elves. Just kidding! No elves. I have to do all the work myself because no elf cares enough to even show up! I mean, c’mon, at least show up for cleaning time, will ya? My own personal elf – aka husband – came defective from the factory and doesn’t have many cleaning skills. ? ? ? Okay, okay. I don’t wanna sound ungrateful. He does help a lot with cleaning. It just takes him a looooong time! But it’s all good. 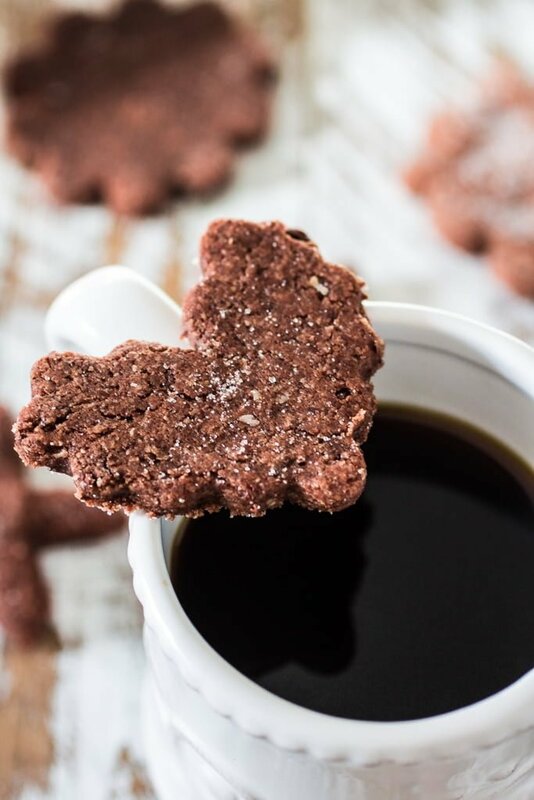 All the hard work and mess that come from baking cookies are soon forgotten when you bite into one of these decadent chocolate spice cookies. You will be glad you don’t have any elves hanging around, because that means you won’t have to share! And when your cookies finish cooling and setting, you now have all the time in the world to play some Christmas tunes and sit by the tree, devouring your cookies, while the scent of freshly baked spice cookies still linger all over your home. For this specific batch, I couldn’t resist buying some Starbucks Holiday Blend at my local Shop Rite. It pairs perfectly with the chocolate spice cookies! True story -> As soon as I wrote these words, I had to stop what I was doing and go make me another cup of coffee. I just couldn’t resist it! Now I’m back here, talking with you guys and sipping my Starbucks Holiday Blend. Pure bliss! ? Too bad I don’t have any more cookies to go with it, since they were all gone in a matter of minutes when I brought them to work last week! Oh well… Guess it’s time to make more? 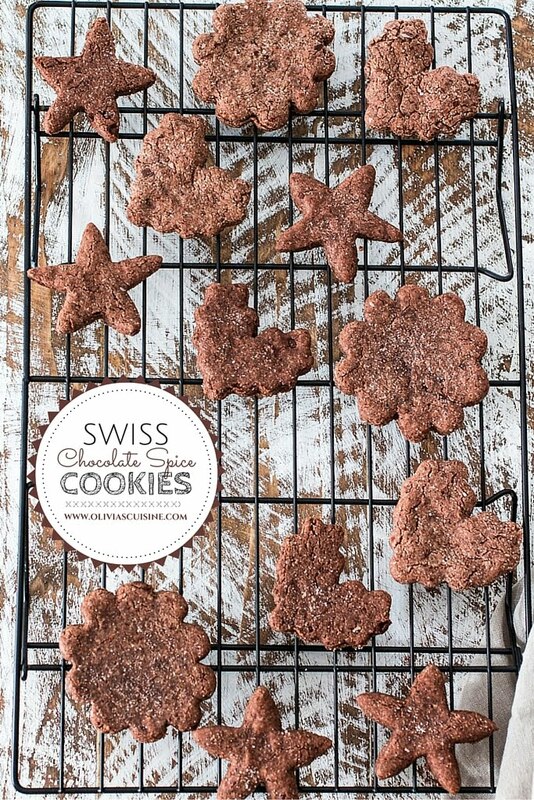 These Swiss Chocolate Spice Cookies also make the most perfect edible Christmas gift. Just arrange them into a pretty tin, jar or basket and voila: an inexpensive yet special delicious gift! Christmas definitely will be sweeter with a bunch of edible gifts under the tree. I can’t wait till 25 days from now, when I’m sitting around the tree with my family, opening gifts! Yep! 25 days until Christmas, guys! Can you believe it? What are your plans to celebrate the holidays? Do you have any fun traditions? What are you baking this year? 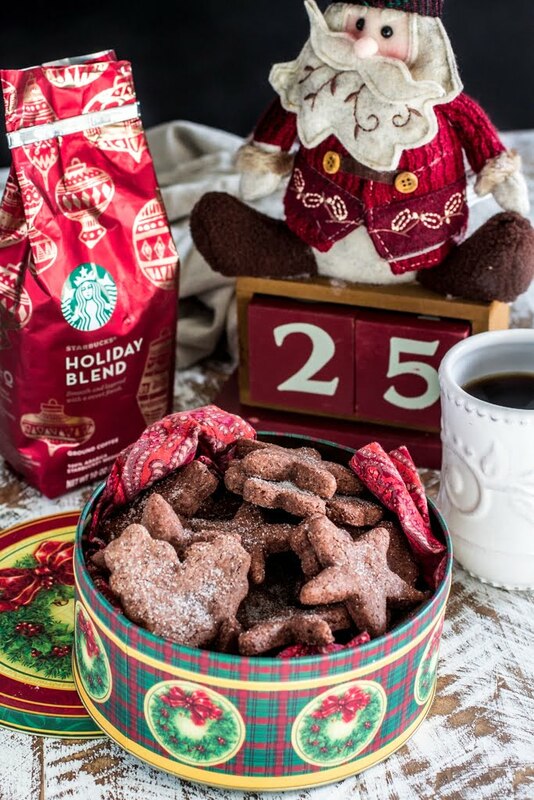 Whatever it is, don’t forget to grab some Starbucks Holiday Blend to go with it. 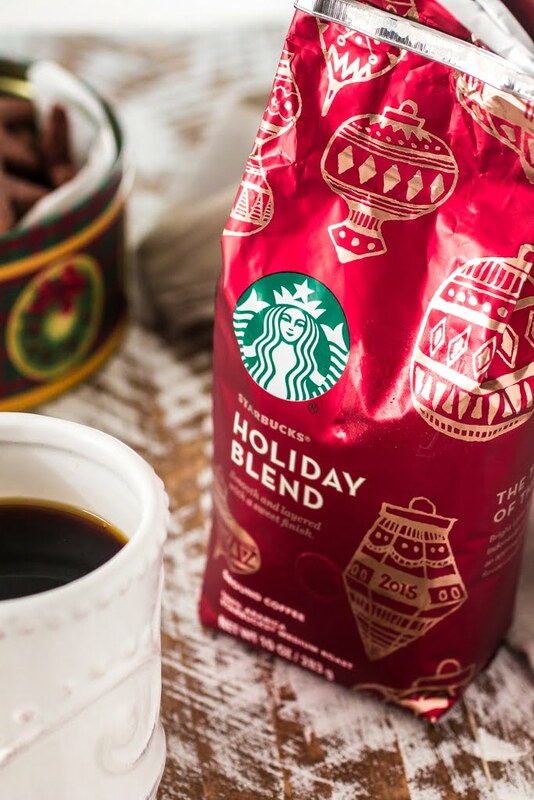 Our friends at Starbucks care so much that they are giving a $5 Starbucks Card e-gift when you purchase 3 or more qualifying Starbucks products. 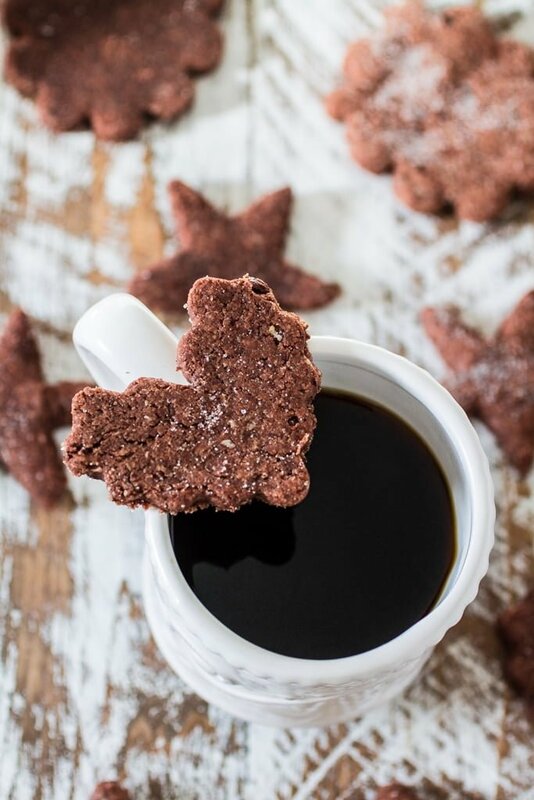 Because there cannot be cookies without coffee! In a food processor, pulse the chocolate until finely ground. Be careful not to overdo it, or the chocolate will melt. Transfer the chocolate to a large bowl and add the sugar, the almond flour and the spices, stirring to combine. Finally, add the egg whites and mix until a dough comes together. Form the dough into a disk, cover with plastic wrap and chill for at least one hour. Pre heat oven to 300F degrees. Sprinkle sugar on your working counter and roll out dough to about 1/2" thick. Cut out the shapes of your choice and transfer the cookies to parchment paper lined baking sheets Let the cookies air dry for at least 30 minutes before baking. Bake in preheated oven for about 15 minutes, or until slightly puffed. The cookies will still be soft when you take them out of the oven. They will set as they cool! Do not overbake or they will get tough. Let them cool and set before serving. If you can't find almond flour at your supermarket, just make your own by grinding 8oz whole blanched almonds in your food processor until fine. Wonderful idea these cookies for Christmas, Olivia! And with this wonderful (the best) Starbucks coffee, our Christmas dinner will have a flourish end! Hi! These cookies looks great, but I do not have a food processor. Can I finely chop the chocolate instead? Hi Baking Beginner. I would melt the chocolate, set aside to cool, and then add to the dough as the last ingredient. You might have to add some more almond flour so the dough doesn’t get too sticky. But it should work! :) Let me know how they turn out! OLIVIA! You did NOT actually make traditional Swiss Christmas cookies?! You rock, lady!! Yes, they keep fine overnight in an airtight container. As for cooling, I let them cool for about 5 minutes on the pan and then transfer the cookies for a wire rack to cool completely! I hope that helps. Would it be okay to substitute the almond flour with all purpose? I can’t find any in the store and almonds are expensives to buy for the grounding.